One of the most popular recipes on Our Best Bites is this flour frosting. Its velvety smooth texture combined with the not-so-sugary bite is perhaps the perfect thing on top of almost any cake or cupcake. If you read through the comments you’ll see that one of the most commonly asked questions is “Where’s the chocolate version??! 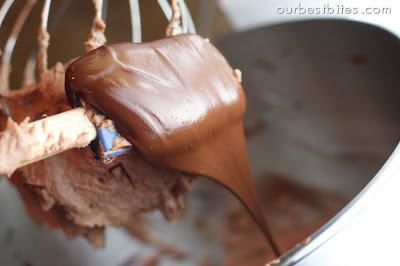 !” Kate and I experimented a lot with adding chocolate to that recipe without much luck. We came up with a lot of things that tasted amazing, but there were always slight problems with the consistency. I knew I had seen similar recipes in chocolate before but I couldn’t seem to find one until one of you dear readers pointed me to a recipe on Sugar Plum. Sure enough, it was just what I was in search of! I adapted the recipe slightly by using plain ol’ salted butter and omitting added salt. And then I added extra chocolate to get a richer color and flavor. Everyone needs a “go-to” chocolate frosting and this is now mine! 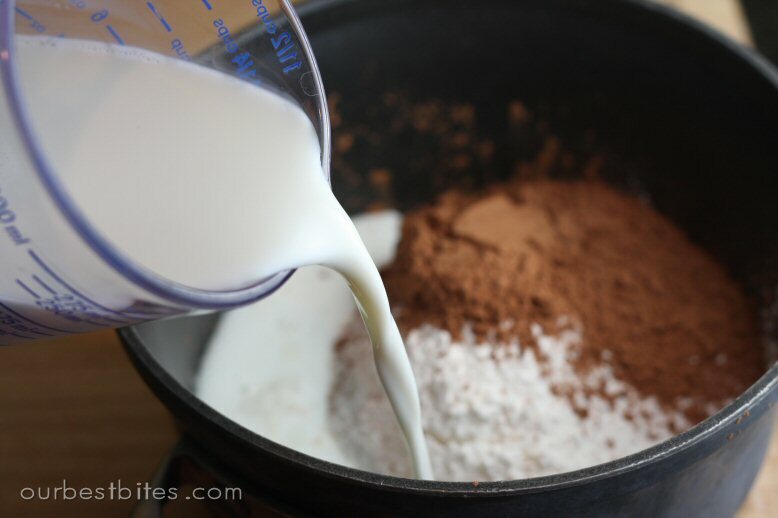 The recipe starts by cooking flour, milk, sugar, and cocoa powder in a sauce pan until it thickens, much like the first step in the beloved white frosting. You’ll strain the mixture so you don’t end up with icky flour lumps in your frosting, because who wants icky flour lumps in their frosting?? While that mixture is cooling off, melt some chocolate chips in the microwave. I found this to be the key to having the frosting remain stable- the melted chocolate seems to bind it. like so. At this point it’s much like the results of just adding cocoa powder to the white frosting. But the secret is adding in the melted chocolate. Isn’t chocolate always the secret?? Melt your chocolate chips if you haven’t already and set aside to cool. You obviously don’t want it so cool that it hardens, but you can get it close to room temperature and still have it be soft and stir-able. In a small saucepan, whisk together sugar, flour, cocoa, and milk; bring to a boil, whisking frequently. Boil 1-3 minutes or until thickened like a thinned pudding. Remove pan from heat and strain mixture into a small bowl. Cool completely in the refrigerator or freezer. 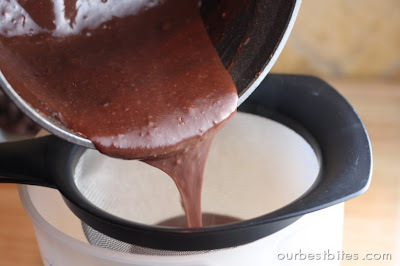 When chocolate flour mixture is cooled, beat the butter until creamy, about 1 minute. Beat in the cooled chocolate mixture until well combined fluffy, about 1 minute. Finally add in melted chocolate and beat again until well combined and fluffy, about 2 minutes. If desired, add additional cocoa powder to taste, up to 4 tablespoons more. Spread or pipe frosting on to cupcakes or cake. Makes enough to frost 24 cupcakes. Storage: Store unused frosting in fridge and bring to room temperature before using again. If needed, beat with an electric beater before using. I haven't tried this yet, but I'm sooo glad you posted it! I moved to Switzerland about 4 months ago, and the powdered sugar they have here is different than in the States–and anything you make with it has a disgusting –REALLY disgusting taste. I thought I'd have to forgo anything that required a frosting. And then you posted this-yahoo! Actually, I've been trying out a whole bunch of your recipes since I've moved here, since there are quite a few ingredients that I can't get here, so I've been trying new instead of old standby's. Reading your comment and being a Swiss, living in Switzerland, I can’t help it but laugh at this comment. I think you have just chosen the wrong type of powdered sugar. The one from Migros is rather ‘sandy’ whereas the one from Coop is super fine (flourlike or dustlike). Have a go with the one from Coop… and beat the hell out of it together with our butter. Our butter contains more fat (=better quality) than water, which makes it difficult to dissolve the sugar in it… hence the disgusting, sorry, sandy taste. You can do the cooked part in the microwave. Just whisk it occasionally. You can use vanilla instead of almond flavoring, but this is hands down the best white cake in terms of crumb, flavor, and texture. I suspect it is because you only use egg whites….Oh, and halving it works perfectly well (the original recipe makes a lot–like 60 cupcakes a lot!). Don’t bother with using any other flavors of cake mixes, they just don’t work as well or taste as good in my humble opinion. Hope you like it as much as I do! Oh, and only use Betty Crocker mix to start with. I have mixed results with other brands. The flour frosting is my FAVORITE go to frosting! So excited to see a chocolate version of it that looks and tastes great too! Flour frosting, what a great idea! Personally, I love SWEET stuff, but I do know a lot of people who appreciate sweet treats that aren't overly sweet. I'll have to make cupcakes w/ this frosting for them. Thank you. Looks like a winning recipe to me! Chaviva- I've never used gluten free flour but I would assume it would work fine. It still thickens, right? If so, then I wouldn't see why it wouldn't work. Hi! I've been following this blog for a while but have never commented. I wanted to tell you both thanks for all the great recipes and ideas…including this one! I will definitely have to give this a try. I like the idea of using flour rather than shortening (aka grease, aka fat) to make a thicker frosting. Thanks for sharing! This looks awesome. 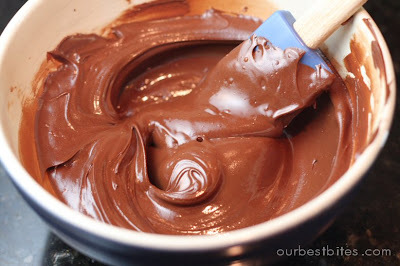 I have about 4 different chocolate frosting recipes I love and I am going to try this one out and add it to my repertoire! I was wondering what the yield is – it doesn't say in the recipe how many cups it makes or how many cupcakes it would frost. I am making 2 doz cupcakes and would love to know if one recipe is enough to pipe or if I should double the batch! Thanks. And I LOVE this site by the way I make one of your recipes ( sweet and savory) almost weekly!! Shanna- it should be enough to frost 24 cupcakes. I'll add that to the post- thanks! I LOVE your blog!!! I have found some wonderful recipes on here that our family adores! My son just had his 4th birthday and I tried a buttercream recipe I hadn't tried before (where you do the sugar water then add to stiff peak egg whites and mix in the butter) it was SOOOO gross! I felt horrible I hadn't tried it before hand but was at least thankful we had ice cream! I completely forgot about your white frosting and I can't wait to try them both!!! Thank you SO much for sharing your yummy recipes! I tell people about this site all the time and I know they have enjoyed it too!!! Excited to see this recipe! Just bought some dark chocolate powder which should work with this recipe perfectly! Nice! I literally just bought cocoa powder for the first time EVER, so I have been looking for a good recipe for it. I loooove your white frosting, so I am sure I would like this. Oh my goodness, that looks great! I've never tried the white frosting, but I'm guessing it's pretty stellar! And as for chocolate frosting, well, with banana anything? Yes, please! I'm looking forward to seeing what you do with it! Again, yes, you've done it again! Oh, how I wish I could just dip my finger in your bowl for a little taste! I will definitely try this. I am a chocolate Lover and I am looking for THE CHOCOLATE FROSTING for my cakes. Thanks for sharing. I'm excited to try this out! I've been on the lookout for a good chocolate frosting recipe because my daughter's third birthday is coming up. Thanks! I think the "flour frosting" is what my grandmother always used to frost red velvet cake. I think she called it a cooked frosting and it is the best frosting for red velvet!! It is one of my favorite frostings because it is not too sweet. Now, a chocolate version… WOW! I will have to make this! this looks fabulous and i must try it. and i hate to ask and reveal my ignorance – but – how do you 'strain' the cooked chocolate mixture? That is the most delicious looking cupcake I have ever seen in my life. Okay – I always wonder this and now I'm really wondering. Usually I can replace magarine for butter (I'm lactose intolerant – butter doesn't even exist in my world) – will it cause problems with this recipe? Shron, it's just as it looks in the picture! Just put it in a fine mesh strainer and use a spoon to stir it around. The mixture will pass through and any lumps will stay in your strainer. Emily- thanks for sharing the recipe! jmommy- a world without butter??! I can't imagine! I actually think you could get away with margarine here. I don't think it would taste as good as butter, but I think structurally the frosting would turn out just fine. Oooo! I see a chocolate frosted something in my future then! Thanks! 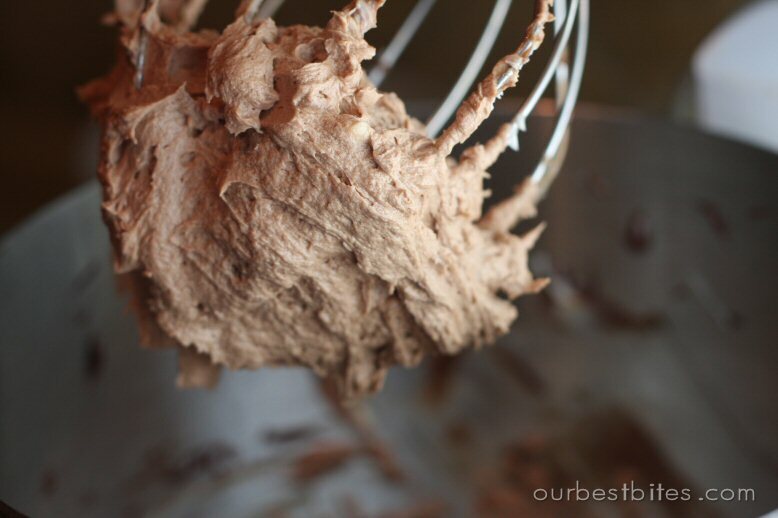 Chocolate frosting is THE absolute best…isn't it? I was just literally today wanting to find a chocolate frosting that would hold up well on a cupcake. I am not kidding! I was coming to get an idea for more freezer meals and there it was!!! Thanks Ladies! I will be trying this tonight. Thank you sooooooooooo much! I just made this frosting, sooo tasty! You said 'up to 4 T cocoa' Is that up to 4 extra T or up to 4 total? I tried this recipe tonight with yellow cake cupcakes! Delicious! Thanks so much!! It turned out great! Also the first time I tried flour frostings! Woohoo! I am so excited to try this one. I have been waiting for this! hey, sara… in the directions you mention salt, but it's not in the ingredient list. how much salt does it take? I was just wondering, if I only have unsalted butter – how much salt am I supposed to add. I asked around and people told me 1/4 tsp salt for 1/2 unsalted butter is the right amount. Is it enough or too much salt for this recipe? It would mean 1/2 tsp salt for this recipe, right? I had seen the white version of this frosting before and really wanted to try it but I have always been more of a fan of white/yellow cake with chocolate frosting so I was so happy to see this version… made it tonight and I love it! Thanks! Made this yesterday and it turned out like a dream! I wanted to just eat it with a spoon! I used it on cupcakes and had quite a few leftover. They sat on the counter overnight and the frosting was just as soft and lovely as the day before. Thanks! Yummy! Made it yesterday and it is the perfect compliment to a cupcake. It provides the perfect creamy sweetness you want. I used milk chocolate chips (all I had) and it turned out great. I tried this frosting over the weekend. It was so light and smooth. I posted pictures of what I put it on at my blog. Thanks for the recipe. I'm making this today. My flour mixture is cooling now, but it's so much thicker than yours, I couldn't get it to go through the strainer, and I'm wondering if I've ruined it. Do you think I over cooked it? I pulled it off the stove the second it started to thicken, but it got thick so fast, any suggestions? Connie, my guess is that it will be just fine because once you beat it, it will thin out. If it were me, I'd probably give it a shot still, but I have no guarantee since I can't see what yours looks like! "[…] due to the fact that actual melted chocolate is also beaten in!). The recipe is from Our Best Bites. And guess what? There is a vanilla version […]"
I just tried this and it was sooo delicious! I ran out of milk so I subbed in coffee creamer diluted with water (sounds a little gross, but it was the best I could do) and the frosting still turned out well. It has a wonderful consistency for piping and its DELICIOUS! =D I honestly can't wait to try to vanilla version. Love love love, Lisa@ lisa-is-hungry. Sara, this was amazing! I used this to frost your cream filled cupcakes in lieu of the ganache (sp?) and it was a big hit! Everyone thought they were bakery made :). Amazing Chocolate Frosting!!! I usually do make the white frosting with the cooked flour mixture and always wanted to try chocolate but didn't want to play around with it myself. So happy to have found this! Buttercream is too sweet for me so this one is perfect — not too sweet and creamy too. OMG thank you so much for posting this! I cannot wait to try it! Does this frosting freeze well? I'm not sure Ruby, I've never tried freezing it. If you do, let us know how it turns out! I love the consistency of this frosting! So fluffy! Thank you so much for sharing. I've been trying to find a fluffy strawberry frosting that uses fresh strawberries. Is there anyway to convert this recipe into a fresh strawberry frosting? Aaah…if I was to add maybe strawberry puree into that recipe, how would you suggest modifying it so the consistency wouldn't be too watery? You should be able to beat it right in at the very end. If you are adding something really juicy, I'd just strain part of the liquid out of it before adding so you have a more concentrated fruit mixture. Oh, I really screwed this up this morning for my husband's birthday. I'm not a huge chocolate fan, so I thought it was probably just my taste buds. I mixed-up the measurements for flour and sugar and created the most bitter frosting known to man. My husband has been sweet about it, but it is depressing to put so much effort into a special homemade birthday cake and then, foul it up with one tiny mistake! His family WAS NOT as sweet as he was, though. 🙁 They kept asking me what was wrong with it, and at that point, I didn't have any idea. A look over the recipe, after they left our home, revealed my problem. Please tell me the regular version is sweet? I loved the consistency of it, so I'm not willing to give up on it for the next go 'round. I made this frosting over the weekend, I don't have a stand mixer so I was using a hand mixer. I don't know if anyone else has had this happen but when i started mixing the butter to the mixture it got all wierd clumpy like the butter was in tiny balls or something. I was really worried that it wasn't going to turn out until I poured in the melted chocolate and BAM! Amazing Chocolate frosting! I wowed everyone with it! This frosting turned out so great! I made it to top some chocolate strawberry filled cupcakes. I used bittersweet ghiradelli chocolate chips. It piped beautifully. I think this will be my go to chocolate frosting. I would really like to make the cream filled cupcakes with this frosting for a baby shower in a few days. I'd love to make them the night before the event. Can I refrigerate them overnight? Yes, you could refrigerate overnight, but it would be better to just leave them at room temp. I tried making it for a second time to make sure it wasn't pure luck that it turned out perfect the first time, and I did kind of ruined it.. the consistency was still perfect but I added a little more cocoa powder and it killed the taste for me, my husband still loves it but I will use half of the cocoa it asks for next time just to be on the safe side. I'm so glad to have found your blog and a confectioner sugar free icing (can't stand the grittiness). I have a few questions for you! 1. I've made this twice now and both times it's actually quite liquid-y. Almost too soft to pipe. The butter I have here is very soft so that may be it. The second time I did it, I chilled the pudding mixture in the fridge until it was cold and that made my butter firm up – like I think another commenter experienced. Thinking about SMBC I figured making butter cold = bad so I microwaved the mixture to make it room temp. I was wondering if making the "pudding" a little thicker with more flour would help it hold better? What do you think? Mine doesn't look as fluffy or stiff like yours does in picture #5. I don't know if it's the wimpy hand-mixer I'm using. THANK YOU! megumi- if the end product is too soft then it's most likely that your butter is too soft. It should be a little colder than room temp. I wouldn't add more flour, if you need it to firm up the best way is to put the finished product in the fridge until it's stiffened up. I'm glad you like it! I've made the flour frosting a number of times now and get rave reviews. My good friend begged me to make chocolate cupcakes for a special day tomorrow so I tried the chocolate frosting and it is too liquidy/soft to pipe. I'm putting it in the fridge hoping it will stiffen up. It tastes great! My oldest already snuck a bit to put on his graham cracker so if it doesn't stiffen up, I guess my kids will have it for a snack this next week on their crackers and will be very happy! Hi, I've made this twice now. Both times delicious, however the second time I had trouble piping as the tip kept getting clogged with little lumps of chocolate. The chocolate had been melted thoroughly and allowed to cool at room temperature for about 30minutes. its as though when I poured it in the flour and butter mixture was too cooled and may have set some of the melted chocolate. Any ideas? Lisa, just make sure you add the chocolate *very* slowly, a little at a time, and while the mixer is running. That way it doesn't give it time to cool into any clumps. I was looking for a frosting that didn't have too much icing sugar and stumbled upon your blog. I made it today for my butter cake and boy it's delicious. I plan to make it often now. But one thing i need to know is that for how long can I refrigerate it? my website is http://thechefinme.com, will post this cake asap, God willing! leemz- it will definitely last a few days in the fridge. Beyond that, I couldn't tell ya because it's never lasted that long at my house! I am planning to try this frosting this evening for my son's 22 birthday tomorrow. It looks perfect for cupcake, but not many comment for using it on a double layer cake, does it hold up between the two layers. And how should I store it when I am finished tonight, airtight or refrigerator?? Thank you so much. I ask myself, "what did we do before the internet." Mary Jane- yes it works great on cake! I actually used it on the monkey cake we have on the site and it holds up really well. Are you frosting the cake tonight or just making the frosting? If you're frosting the cake, you can just keep it at room temp. If you're wanting to store the frosting you can refrigerate it. Tomorrow you'll need to let it come to room temp on its own and then beat it again to fluff it up. Should work great! The other day I made the candy corn cupcakes and learned how to do the frosting good. We had a BBQ tonight, and I decided to try just store-mix cupcakes with this chocolate frosting. I was told that they were the BEST cupcakes they had ever eaten. I took the advice and automatically added the extra 4 TBS cocoa. The frosting came out perfectly! Thanks! The delicate chocolate flavor is superb and not overpowered by sugar. The silky texture is awesome; it melts in your mouth like a no other frosting I've ever made. While it does have a consistency that will accomplish simple piped borders and cupcake swirls, the finished product is not sturdy enough for much more. I believe I would dam layers with regular butter cream if I were to use this frosting for a filling. Still, I believe it's going to be my go-to chocolate frosting from this point on. I'd like to share a couple things I did to make the process easier for me. 1. I sifted the all-purpose flour, granulated sugar, and powdered cocoa together several times until it was well combined, and no "chunks" of anything remained. Then, I set this mixture aside. 2. I cooked the ( whole ) milk and sifted ingredients in a large frying pan, over a medium-high heat, and used a large whisk to constantly incorporate and scrape the sides and corners of the frying pan. 3. The ( whole ) milk was warm before adding the sifted ingredients in three 1/3 cup increments. Then, I cooked the mixture on medium-low – removing it from the heat several times to check consistency – until it reached the "loose pudding" stage. I did not allow the mixture to "boil" as noted in the directions. The results of the changes noted above produced a completely flawless mixture without lumps. Thus, I had no need to strain the cooked mixture. Additionally, the cooked ingredients would not "pour" when it had cooled. So, I had to spoon the mixture into the creamed butter. From this point on, I followed the directions given, and was delightfully surprised by the results. I didn't realize there were two separate recipes for chocolate and white until *after* I started cooking the flour and milk together on the other recipe, at which point I ran back to my computer to see what I needed to add for chocolate and Oh NO! It's an entirely different process! I was making a double batch of the vanilla, so after reading this version I went ahead and made the vanilla as directed on the original. When it was finished, I added one cup of cooled, melted chocolate chips and 4 tablespoons cocoa powder. It came out perfect and tasted fabulous! Just thought you might want to know, since it seems much quicker than having to sift cocoa powder and cook it with the flour. that's great to know- thanks BreeAnne! I tried this in a pinch yesterday for a Christmas party… and the frosting came out like pudding! I don't know what in the world I did wrong. I ended up making a Trifle Bowl concoction with it. Just made some from-scratch funfetti cupcakes and was looking for a good frosting recipe – this was PERFECT!!! since the cupcakes were a bit on the sweeter side, i dialed down the sugar which came out with a great bittersweet chocolately flavor that totally complements my cupcakes. THANK YOU SO MUCH! 🙂 def my new favorite frosting recipe. delicious! Robin, the only thing I can think of is if your chocolate-flour mixture wasn't cooled enough. Other than that- no idea, weird! Great recipe! I whisked the flour, sugar, and cocoa together really well before add the milk and boiling and didn't have any lumps that needed straining… worked for me anyway! Is there a peanut butter version? The pb frosting recipe I have is way too sweet and overpowers the pb flavor, and I LOVE the white/vanilla version of this and the chocolate one is a really good too, Not so overpowering as the powdered sugar frostings. I just made this frosting and it is seriously the best frosting I have ever eaten! I love your blog!!! I just found it about a week ago and have already tried 5 of the recipes. I love that you use real ingredients and that everything tastes so yummy! Thank you so much! This is, hands down, THE BEST FROSTING I have EVER had. The second best is the white version. For a bridal shower, I made cupcakes using your easy white cake recipe (and the chocolate version) with these frostings. Everyone LOVED them… I think everybody had at least two! This frosting is awesome! I have made it several times and love it but today I made it for my husbands birthday cake and made some changes that worked really well so I though I would share them with you. My husbands favorite cake is an ice cream cake and I have found that most frostings when frozen turn too hard and leave a fatty film in your mouth. I know it is the resolidifing of the butter so here is what I did; when cooking the chocolate flour mixture I let it cook a little longer than recommended till the consistency was a bit thicker, more like a custard. It took a bit longer to get through the mesh strainer, I actually used a rubber spatula and just pushed it through. Now here is the best part, I only used half the amount of butter! It still whipped up with a nice fluffy consistency and tasted great. I almost dont feel guilty that I ate more of his cake than he did. Thanks again for all your great recipes. I’m not really a “semi-sweet chocolate” fan. Have you ever tried it with milk chocolate? Does that make it too sweet? I made this with a couple of alterations (used dark choc. cocoa powder and a combo of milk and PB chips) and it was soooo good! Not as stiff as it appears in the photos here, but I did stick it in the fridge and it was good to go. The taste/texture/meltiness of it reminds me of the centers of Lindt truffles, which I LOVE. Thank you for a new frosting recipe to add to my book! I put the milk and flour in the blender before I cooked it. No lumps, no straining. Hooray!!! Very very yummy! I had a ton left over, so I popped in in the freezer. I’ll report back when I know if it froze well. I have to comment on this…this frosting is seriously the BEST frosting I’ve ever had!!! It is also a hit with my entire extended family. My husband, who does NOT like frosting, especially chocolate, LOVES this frosting! Thanks so much ladies, you came through again!! The white version of this is also delicious! When I made this it was hot in my kitchen and it wasn’t coming out very fluffy, so I popped it in the fridge and waited patiently, whipped it again and ta-da!! BEST FROSTING EVER!!! OH Yeah almost forgot I added another cup of melted chocolate. What tip do you use for the frosting on your cupcakes? I really like the look and would love to duplicate it!!! Just made this for my daughter’s birthday cake. It is the best frosting I’ve ever made and I’ve made a lot. Thanks for this version! Next time I think I’m going to try adding Nuttella instead of the melted chocolate. Didn’t want to mess around with this for such an important day. It was perfect and easy to frost her large cat cut-out cake. I made this the other day and it was soooo good!! I topped it on black bean cupcakes and it was the perfect compliment! Lisa B, I was wondering how Nutella would work in this recipe, too! I worried that it may not firm up as well, because it originally isn’t solid. Maybe you can let us know how it turned out! This frosting is amazing. My fiance really doesn’t like powdered sugar-based frostings so I’ve been looking for alternatives. While a swiss meringue buttercream is delicious, it’s quite involved; this is so much easier! And it’s so chocolatey. This is going to be my go-to frosting recipe from now on. Thank you so much! Sooooo good! Can’t wait to try it. I’ve been looking for the perfect frosting without Crisco! Sara, will this recipe be enough to frost 2 9×2 cakes? how about the white frosting recipe? Thank you so much. If I use unsalted butter, how much salt should I add to it? Not sure Stephanie, I’d just do it to taste. But we’ll see, making this frosting tomorrow! wish me luck! This recipe is perfection. I followed instructions and had the best frosting- a French friend who prides herself on baking actually asked for the recipe. Incidentally, I tried it with strawberries and it works just fine. Not as pipable, but still very tasty. Oh my word! If this is as good as the white flour frosting, I can NOT wait to try it! I’ve made the vanilla flour frosting and love it, so I’m excited to try this chocolate version. However, I have a no-milk participant in the consumption party, so I’m wondering about subbing in either rice milk or coconut milk. I’m new to baking/cooking with those milks. thoughts? advice?? Not sure, you’ll have to experiment! The first time I made this, I kind of drizzled the melted chocolate in and when it hit the whipping blade, it flung it to the sides of the bowl, making the choclate get hard, thus leaving lots of little bits of un-mixed chocolate in the frosting. I used it to frost cupcakes, and while fine for cupcakes, it would not work for a nice cake. 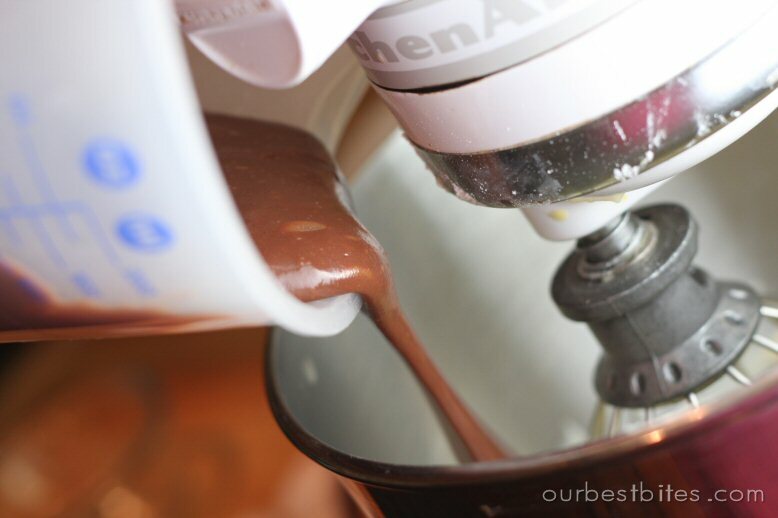 The second time I made this, I shut off the mixer, lifted the blade, and then carefully added the melted chocolate to the bowl, and then very softly mixed in the melted chocolate. It worked perfectly this time! It went great on cake I made. I did use a total of 1/3 cup of cocoa powder, which I added all to the initial mix to cook. I did not add the extra cocoa at the end. Not very sweet, but the triple chocolate fudge cake with caramel toffee chip filling was sweet enough that the two melded perfectly together. Thank you for sharing this frosting recipe, it is the most delicious cupcake frosting I have ever had, now when I have the hard buttercream from the professional cupcake shop, it just doesn’t measure up to this one. BTW – I was lazy and didn’t bother straining out the lumps and didn’t end up with any in the end, must be the beating of all the ingredients together. How long does this stay good for since can’t be refrigerated? Thanks again. You’ll definitely want to store the frosting in the fridge, it just needs to be brought to room temp and re-whipped before using. I modified half the original recipe and it did 9 cupcakes piped high. I made the version below and got enough for close to 15 lol My first batch was quite runny (and not enough anyway), so I refridgerated it while I made the second part, and then whipped the two together and it was perfect! So if it’s a bit runny, just stick it in the fridge for a wee bit! I made it as per Sara’s recipe. The only thing you might need to play around with is the flour – as cocoa powder absorbs moisture, I found the addition of a little extra flour to be helpful to get the sugar/flour/drinking chocolate/milk mix to the correct “pudding” stage – if it wasn’t thickening up, I simply took it off the heat, whisked in another Tbs of flour very quickly to ensure there were no lumps and then put it back on the heat to cook the flour. You can also add a bit more white chocolate drinking mix to taste once it’s all combined. I don’t use fondant so I can’t tell ya for sure, but it does set up pretty well so I would assume it would work? I made this – it was delicious, although slightly ‘unstable’ 🙁 Could I add meringue powder to stiffen it up at all? Also, how long can I keep any unused frosting for in the fridge please? I’m not sure about the meringue powder, I’ve never had a problem with it being unstable- you’d just have to experiment. And you’ll have to play the frige by ear too, at least a few days. This frosting is ABSOLUTELY PERFECT!! Thank you SO much for sharing! I’ve never been a frosting fan due to it being too sweet and overpowering, so I went on the hunt for a “light and fluffy” frosting recipe and found your blog. This came out not only delicious but BEAUTIFUL! I was afraid I cooked the cocoa/flour mixture a bit too long, as it was more a pudding-y texture when I took it off the heat (but no lumps!) but it turned out great. I used it atop the “chocolate chip cookie dough cupcakes” recipe on allrecipes.com and it is just what they needed because (as you can imagine) they are sweet enough by themselves. Thanks again! My frosting was delicious but wasn’t stable. Does the butter need to be colder? My frosting was never fluffly but more like a mousse. I want to remake but of course want to make sure i’m not missing something. When I refidgerated my cake the frosting did harded up but as soon as it came to room temp it was moussie (i jus made that word up) (my butter was room temp and I did feel like my stove mixture was closer to a pudding consisentcy than thin pudding). Help! Hmm, I’m honestly not sure! The pudding mixture is probably better if it’s a little thicker, so I don’t think it’s that. You might just have to keep experimenting! Honestly, I’m not too picky about chocolate chips! I usually buy Nestle, Tollhouse, or Guittard. Thanks so much for the fast response, and for all your amazing recipes! I’m excited to try this, the flour frosting rocked my world (in the best of ways) when I discovered it, and I’m sure this will do the same. Haven’t tried the chocolate version yet, but the vanilla one was very nice. I didn’t have to worry about lumps because I put the whisk attachment on my mixer and blended the flour and milk in a small bowl until smooth before heating it. I also don’t particularly like things made with white sauce so I was very hesitant to try it. I didn’t want to risk tasting raw flour in my frosting, so I cooked it until it was quite thick. Thicker than pudding as the recipe suggests. I let it cool (get cold) in the refrigerator while I mixed butter and sugar. When I combined the flour mixture with the sugar mixture, it never even went through the “ugly” stage. It didn’t even take 5 minutes. Made it twice, once was a double batch and it turned out great both times. Oh, I made too many cupcakes so I put them in a covered container in the frig for a couple of days. The frosting was hard while it was cold, but once it reached room temp, it was exactly as before. No seperating at all. I even prefered the cold texture. VERY firm and smooth, but I’m weird that way. I’ll be trying the chocolate version tomorrow! I’ve tried the white version twice and just tried the chocolate this weekend. My frosting never gets stiff, I’m thinking I need to cook it to a thicker pudding. When I pipe it on cupcakes it kinda spreads like it hasn’t set up. Any ideas? I found the first time that when I let it come to a boil it gets too thick and there’s no hope of straining it so better to take it off the heat as soon as it gets to a thin pudding stage. I also found like a previous poster that if you make sure your dry ingredients are mixed well and you add your milk slowly while whisking it, you won’t end up with any clumps to strain out. The mixture needs to become cool before you can blend it with the butter. Mine was warm and didn’t set up right but after putting it all back in the fridge for 20 minutes it whipped right up. So delicious! I don’t usually make cupcakes more than 1-2 days ahead of time. They won’t go “bad” but they certainly won’t be as good. This chocolate frosting is amazing. AMAZING. I used it on my daughter’s 13th birthday cake. Thanks! this is real beautiful recipe, many thanks. This frosting was delicious. I was a little skeptical about the amount of butter but it all worked out in the end. The only modification I made was to cook the flour and cocoa mixture until it was VERY thick. I cooked it for a lot longer because I could still taste the flour. I was whisking the whole time so I wouldn’t have to strain it after and I didn’t. It was amazing on an orange sponge cake! Could you please post a link to the original recipe? I can’t find it on the Sugarplum website. But the only reason I want that is because I really need to know how much salt to add if I don’t use salted butter. I never keep salted butter in my house, but when I made the white frosting with unsalted butter, I thought it needed a little salt. I’m not good at adding anything “to taste.” Thanks. I’m not sure- you’ll have to search around for it over there, sorry! I think this is the best frosting recipe I have ever tried. I would also like to convert this into various flavours such as mocha, caramel, etc. Any thoughts and advice on that. For caramel, try palm sugar (also known as coconut palm sugar). It has a caramel taste. I subed it in some cream cheese frosting and it had a nice caramel taste. It added a caramel color to my icing, but since this recipe uses less sugar it won’t add as much color. I made a 6 inch cake and frosted it with your chocolate frosting. I kept the left over in the fridge for 5 days and the frosting got richer and it just melts in your mouth. I just cut down on the butter to 1/2 cup, the sugar to 1/3 cup and the chocolate chips to 1/2 cup. I just want to know why do I get a grainy consistency all the time? I tried to whip it more but it formed into clusters. I tried to use the 1 cup butter but it was too creamy and buttery for my taste. The color was so light & it didn’t look like a chocolate frosting that I have to re do it again then cut my butter to 1/2 cup. What did I do wrong? I somehow totally messed this up. I had all the ingredients right, but maybe my timing was off. The chocolate “pudding” was super thick and the melted chocolate chips wouldn’t incorporate. I’ll try it again, but for this cake, I think I’m going to go with plain old buttercream! It’s not a recipe problem, just thought I’d share my mishap in case someone else had trouble. The recipe is great–I’ve made the white icing before and it turned out wonderful! I’m so glad I finally found a chocolate frosting that tastes really good and not just really sweet. I put it on a yellow cake and we even froze some of it (frosted cake) and it still tasted great. I did change a lttle bit, I used half semi-sweet and half milk chocolate and used 100 gramm of each, so a little bit more than the recipe asks for. I made these, DELICIOUS, but the frosting is very light, is there a way to make it stiffer ????? Glad you liked it, you could always add a little powdered sugar if you want to make it stiffer, but it will add more sweetness too so keep that in mind. Wow. This is the best chocolate frosting I’ve had in years. I live in Asia, so I used candy bars instead of chocolate chips. I prefer semi-sweet to milk chocolate, but even with milk chocolate, this frosting was delectable. I was doubtful – but this frosting has made a believer out of me! I was wondering if you could tell me how many grams or ounces of chocolate chips you use? I prefer to use chocolate from a bar and not sure how I’d go about measuring it in a cup as I find it hard enough most times (I’m in the uk). Thank you! This is the best chocolate frosting ever. I will NEVER make frosting with powdered sugar again. Okay…never is a long time. Maybe I will sometimes, but the point is, I REALLY like this frosting. Hi, is cocoa powder in choc frosting, sweetened or unsweetened? Hi, is cocoa used in choc frosting sweetened or unsweetened? Hello from Mexico! Greatest chocolate frosting ever! Easy to make, holds and pipes well and of course delicious. I used mexican semi-sweet chocolate that has a little cinammon and vainilla and everyone loved that special touch! Hi , I would like to know if i can use white chocolate instead of cocoa or if i can make this frosting without chocolate ? This has become my go to chocolate icing recipe. It blows my mind how good it is every single time I make it. Today I did a variation on it where I added 1.5 Tbsp espresso powder to the milk mixture. Holy dark chocolatey mocha goodness!!! I’m making this as we “speak” and it doesn’t look right! After I beat the butter and added the cooled chocolate mixture it looks a mess. It looks like its separating? It’s not mixing beautifully. What am I doing wrong I tried it before and it came out delish, but I can’t seem to get it right again. Could it be the chocolate mixture was cooled in the fridge and was still cold? Am I supposed to wait for it to come to room temperature? Me again 😉 lol before you answer I wanted to ask should butter and roux be at room temperature? Or can I whip up cold butter and mixture? My butter was wood temperature and mixture was straight out the fridge. Wish I could post a pic..
Great recipe! I was out of powdered sugar and didn’t feel like running to the store and this was the perfect solution. I found it a little bitter when I added the extra cocoa so added a jar of marshmallow creme. It turned out great! Next time I’ll try adding just a bit more sugar at the beginning and see how that goes. I want to use this on the monkey cake you have posted. But I really stink at making frosting. (I tried and my version was a failure!) You say to “Melt your chocolate chips if you haven’t already and set aside to cool. You obviously don’t want it so cool that it hardens, but you can get it close to room temperature and still have it be soft and stir-able.” Well, my chocolate chips get soft but never get creamy as yours does. And I can’t cool them because they go from soft to hardened right away. But if I melt them longer they harden (as in burn) even if I’m stirring them. I’ve tried the microwave, the stove (double boiler) and still no success (different chocolates too). Needless to say, this recipe didn’t turn out very well. It did get fluffy but then is rather soft. Does not stand up at all and certainly couldn’t pipe it onto a cake. What am I doing wrong??? I mess up every frosting I try (well, except maybe the butter and powdered sugar one). 🙂 I have tried everything I can think of, like I said, using the microwave or stove various kinds of chocolate, etc. HELP! RH- the recipe as written should work just fine so I’m not sure what to tell you- I’m sorry I can’t be of more help! Yep, it will be just fine at room temp. You can do this! This is the best chocolate frosting I’ve ever made. It took every ounce of my willpower to not eat the entire bowl with a spoon. In fact I left a small amount off the cake just so I could eat it right away. This is a keeper. 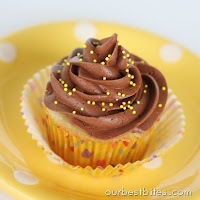 I have been searching for a cupcake frosting that I have seen and tasted that is SO Creamy! I guess the cooked flour frosting is what I’ve been looking for! I will be making them both soon. My question is – what other ingredients can be added other than liquid flavorings? Fruit, cookie crumbs, champagne, baileys liquor? Thanks for your help! This chocolate frosting recipe is fantastic. Chocolate buttercream just doesn’t do it for me. It’s never as chocolatey as I want it, it’s too sweet, and the texture is just too buttery, leaves a bit of a film in my mouth. But this frosting is super chocolatey, not too sweet, and the texture is smooth and creamy yet also fluffy. Very very good! This will be my go to chocolate frosting recipe. I remember going to a little restaurant called “The Europa Cafe” run by a Swiss man. His tortes were grand…the “icing” not tooth-ache sweet as most stuff around at that time. He said the recipe was based on a pudding (like your flour-milk base?!). So glad to find this on your site, I will be making it soon. The Dr. Oetker cookbooks have a similar recipe (using their pudding packets)…the most important step is to have everything at room temp to ensure smooth blending! Thanks so much for this. Can we use raw sugar instead of granulated? Also wanted to thank you for this recipe – I just found it a couple days ago when looking for a chocolate version of the flour recipe. This was AMAZING! Also wanted to share with my slight change: Instead of using semi-sweet chocolate chips, I used Baker’s Bittersweet chocolateeeee (66% cacao) – same amount as called for the chips. It had a wonderful deep chocolate flavor and did not need extra chocolate powder. I just made this frosting for my sons chocolate birthday cake and swirled the cake with hot fudge before I cooked it and then after I frosted the cake, I melted some high end german milk chocolate bars and drizzled t over the frosted cake and allowed it to set up before I served it. I must say, it was amazing!!!! Not to say that it even needs the milk chocolate drizzled on it because its awesome without t too, but it really was a fantastic addition because the frosting snt too sweet so it can be done without overkilling it like with other chocolate frosting recipes that are just too sweet to begin with!! 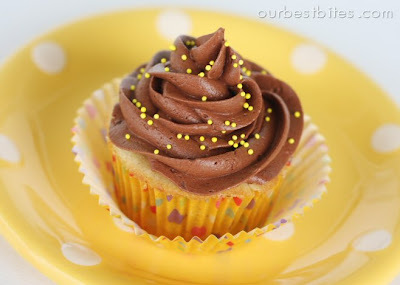 Made this the other day for cupcakes – awesome frosting! I was worried the flour mixture was too thick (but so smooth, I did not strain); I went with it – blended just fine. I did have to re-melt the chocolate; the flour mix took a bit to cool. I might not do that first next time… It all whipped together so nicely though! I did add all 4 T of cocoa, but only because it felt so light/thin that I wasn’t sure it would hold. I also put the finished frosting (still in the mixing bowl) in the fridge for a few minutes (it was warm in my kitchen, I thought that may have had something to do with the consistency) and then re-whipped it. Piped nicely with the 1M as suggested =) At the very end though, I think the warmth of my hands may have caused a bit of separation (speckling? )… I frosted 12 regular size cupcakes and about 30 minis. Today, the last 2 minis are holding up nicely – they’ve been left out Thursday pm to Saturday am. Wonderful recipe overall, thank you! !